Millard Fuller was the author of eleven books and awarded more than a dozen honorary doctorate degrees. He was a millionaire before age thirty and gave away his entire fortune before he was forty. He was a lawyer, a friend to presidents and world leaders, and an advocate for the poor. He was a husband, father, and grandfather. He was a tall, skinny kid with big ears from Lanett, Alabama. He was founder of Habitat for Humanity and the Fuller Center for Housing, both movements organized to eliminate substandard housing worldwide. Because of his unfailing vision and tenacity, Millard was responsible for sheltering more than a million people who had been living in poverty. Millard Fuller was the founder and president of Habitat for Humanity for 29 years prior to founding The Fuller Center for Housing in 2005. Fuller’s business expertise and entrepreneurial drive made him a millionaire by age 29. Then, after a re-dedication of his life to family and to following God’s path, Fuller and his wife, Linda, decided to sell their possessions and give their money to the poor. Following mission work in Africa, the Fullers founded Habitat for Humanity in Americus, Georgia, in 1976. 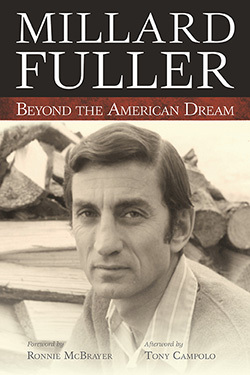 Beyond the American Dream is the first of eleven books that Fuller wrote during his lifetime. He received numerous awards, including the Presidential Medal of Freedom, America’s highest civilian award, and more than fifty honorary doctorate degrees for his outstanding leadership toward meeting the goal of eliminating poverty housing worldwide. As I read Millard Fuller’s autobiography all of the wonderful feelings of “greatness” about Millard come to life. While I knew part of the story, reading it in his words is nothing short of AMAZING! Millard and Linda have always been inspirational heroes to me and after reading this recollection my admiration for both of them has grown. This book is a privilege to read. Millions of people all over earth have been inspired and enriched by the lives of Millard and Linda Fuller, especially through the work of Habitat for Humanity and the Fuller Center for Housing. Now comes this amazing manuscript, very much like an exciting archeological discovery, that reveals the dramatic background for those achievements. Anyone who has read the story of Jesus and the "rich young ruler" and wondered what might have happened if that young man had found the courage to follow Jesus - should read this modern sequel to that story. Here's the sort of thing you could have done, young man - and the rest of us can too, or something similar. "This is exciting stuff," as I've heard Millard say so many times! Millard Fuller was one of the most amazing people I have ever known. He was a mix of a down-home manner and bigger than life actions. In his own words, he shares the early years of his story with honesty and boldness. If you never met this giant of an entrepreneur and philanthropist, you will now as you read his book. If you knew and worked with Millard, it is like being with our unique and loving friend again. To all he remains an inspiration. Beyond the American Dream completes the amazing Spiritual Autobiography of Millard Fuller.This story is a blueprint for finding spiritual peace in a modern day world consumed by the chaos of money and success. Through Millard's words, we learn to slow down, be still and to listen for the voice of God. I call on you to read, mark and use this story as a beacon for your spiritual growth. With a smile on his face, a twinkle in his eyes, and a hammer in his hand, Millard Fuller brought enthusiasm to building affordable housing for those in need. His energy was contagious and his motivational skills were un-bounding. As you read about this remarkable man and his wife, Linda, be inspired to share in their dream and share in the vision.